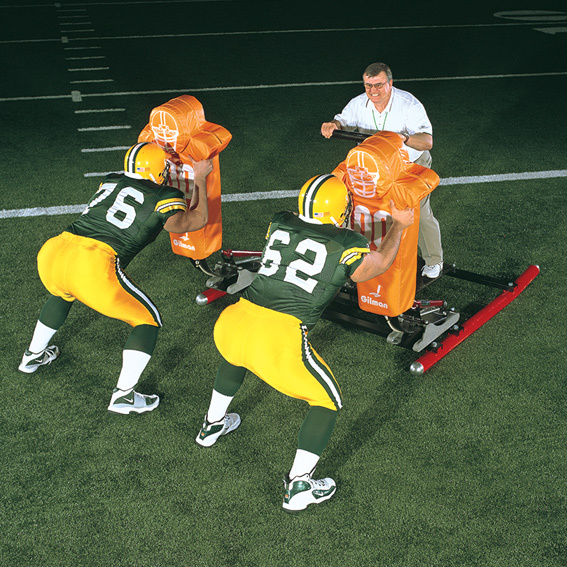 The 2-MAN SLED teaches two blockers to come off the ball with a coordinated charge. Ideal for teaching Tackles and Tight Ends to combo block and Fullbacks the mechanics of the drive block. Wide pad spacing allows you to take an inside or outside shade on the ball. Hip explosion will knock the sled off the line and sustained leg drive will move it down field. If you don’t stay square on the pad, the sled will veer off to one side or the other. To drive the sled you must maintain proper base and foot fire. Pad splits 42". Sled length 6'. "The coaching point is to teach two blockers to work in unison against realistic resistance!"